Devon is one of the well-known brands in Audio/Video receivers with many satisfied users. 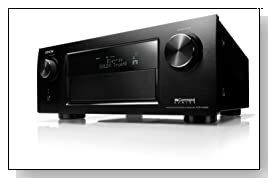 We considered one of its hot selling models Denon AVR-X4000 for our review. Our team found this model as best-in-class with great features and amazing performance, and worth for posting a review here. This model will surely redefine home cinema experience for its users. Best suits for one who can spend extra money but can’t compromise on performance and quality. Sophisticated technologies for best surround sound performance and attractive design. Standard definition to Ultra HD video quality upscale. Supports for Apple’s AirPlay technology. Ultimate power of 235 watts per channel. This 7.2 channels model comes with maximum power of 235 watts per channel, which is best in class compared to other products available in market. Along with this great power the model also makes use of latest and sophisticated technology for both audio and video decoding. AVR-X4000 brings new life to home cinema entertainment. Not just for movie nights, this product will surely turns you a music addict. The system brings out amazing audio performance using its Audyssey MultEQ XT32, Audyssey DSX, Audyssey Sub EQ HT, Audyssey Dynamic Volume, Audyssey Dynamic EQ, Audyssey LFC, and Audyssey Pro technologies. This audio/video receiver comes with seven HDMI video inputs and three HDMI outputs. Analog standard definition videos are upscaled to 1080P HD and 4k next generation ultra HD (3840×2160) video quality. This model gives incredible quality video through this upscale. Other than outstanding audio and video quality, this model also offers tons of great features. It supports Apple’s AirPay technology, you can play media files stored on your Apple products or through iTunes wirelessly. This receiver also plays streaming media files and online radio channels through Pandora, Spotify and SiriusXM services. Overall the audio and video performance of this model was outstanding compared to other products. This system brings in powerful bass and clear vocal at all volume levels making use of sophisticated technology and high watts per channel. Also it has got few great features and this model’s features to price ratio is really good. We have listed only few key features of this product in this review and Denon AVR-X4000 has much more to offer.